Made in San Francisco, Acme Made is one of the reputed brands and Skinny sleeves are specially designed to protect your gear and complement your lifestyle with a variety of colorful options. The Acme made skinny sleeve uses a stylish stretch stitch seam which enables an ultra thin protection to the devices and also includes a sew. 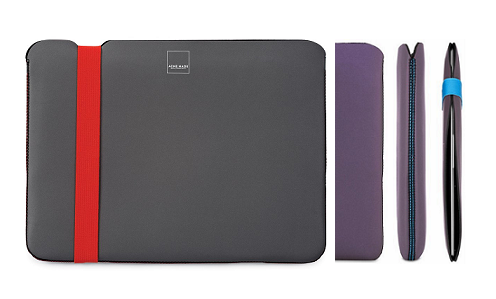 Not only mobiles, iPads, these are perfect for bigger laptops such as MacBook Pro, Dell Inspiron and so on. StretchShell - It is made using highly durable Neoprene simply makes it water and stain resistant. Its sewn-in reinforcement on both sides provides extra protection and better fitting. A perfect soft case for today's devices. Not only this, Skinny sleeves are available in many variants, colors, and sizes so that no matter what device you have, there is a safe case available from ACME made. So why risk your costlier gadgets? Add them an extra layer of comfort and style with Acme Made Skinny Sleeves.